Machining Services, Inc. designed, built and tested this Mil-Spec Transport/Shipping Container used for the Interceptor missile. Using Mastercam and Bobcad CAM, we designed the Mechanical Assembly and created Assembly Drawings. 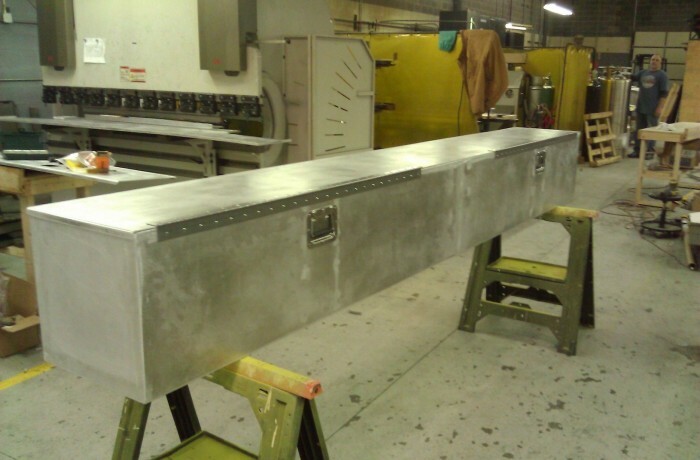 In fabricating this military shipping container, a wide range of processes were required including: Laser Cutting, CNC Braking, Welding and Assembly. This mil-spec container was composed of 1/8" and 1/4" Aluminum Sheet, Military Grade Latches, Stainless Steel Hinge and Stainless Steel Rivets. Next, a First Article was sent out to be Drop Tested per Mil-Spec requirements. The final weight of the container was 130 lbs. and it measured 128" long x 16" wide x 16" tall. We held a tolerance of +/- .030" on this project. 1/8″ Aluminum sheet, 1/4″ Aluminum bar, Stainless steel latches, Rivets, Stainless steel hinge.